"Halloween is so much fun," I tell Frenchy, "because it's all about dressing up, and that happens to be something I excel at." Even Nancy's plain parents feel the pull of the holiday party mood and turn out as a cowpoke and the wicked Wizard of Oz witch. But, as always, Nancy's creativity goes beyond the conventional. None of her usual feathers and glitter for this occasion. Instead, the fancy girl has gone minimalist, in a plain-Jane brown leotard and tights, a simple spiral of leafy vine around her spiral curls, and with a brace of blown-up purple balloons--voila'--she's a virtual bunch of harvest-time grapes. Her friend Bree is also appearing as fruit, in her case a plump red strawberry, fancied up with sequined seeds, and the two are soon sampling Halloween bon bons and trying out the party entertainment. And that's where Nancy's original costume idea encounters a design flaw. Attempting to bob for apples, in her zeal she pops four balloons, and when she lines up for a shot at pinning the tail on the monster, Robert's pirate sword accidentally takes out a couple more. But the costume coup de grace comes when in a game of musical chairs Nancy plops down and pops the rest of her balloons with a big bang. "This is a disaster!" I cry. "Now I'm just a brown stem, and brown is such a plain color." 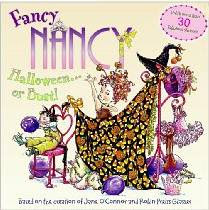 Luckily, Fancy Nancy: Halloween...or Bust!, (Harper, 2009) Jane O'Connor's latest, is not just a plain I Can Read Nancy story. It's a sticker book too! Nancy is a girl who can think outside the box, er, story line, and now it's the reader to the rescue! "Then I get an idea that is both fancy and smart. YOU! Use the stickers to make me a brand-new costume. And please make it extra fancy!" And illustrator Robin Preiss Glasser provides plenty of opportunity (and poses) for young readers to exercise their creativity concocting costumes for Nancy in this new holiday offering for the beginning reader. at least, the second book of this collection, my daughter push me to buy the first one, now she realized about the lauch of the second, of course that I gonna end buy it.